I have been a regular visitor to Vegas for several years now. I find it a fun vacation spot. Its warm, theres lots of stuff to do and its an easy trip from my home. Lately I've started to notice that I've been spending more and more in Vegas on food and accommodations. It used to be in the olden days that every casino in Vegas had fabulous hotel and food bargains to lure people into their casinos in order to lose money gambling. Today though it seems that the bargain food is a rare thing most often seen in the dive or off strip hotels. Every year it seems that buffet prices go up $1 or $0.50. 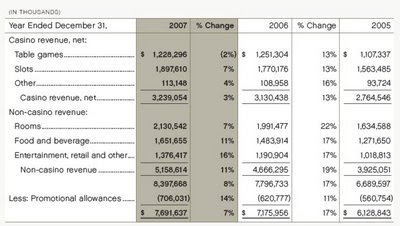 I've wondered lately how much revenue Vegas gets off food and hotel compared to casino operations. We can see that over 60% of the revenue comes from non-casino operations. Gambling only accounts for 40% of their revenue. Table games make less than slots. 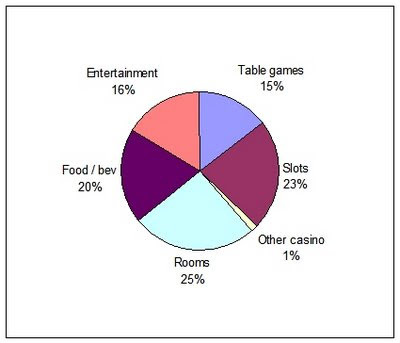 Rooms, food and entertainment each make more as individual categories than table games. Keep in mind this is just the numbers for one major resort and I'm making an assumption that other casinos in Vegas have similar income distribution. But I think that is a pretty reasonable assumption.